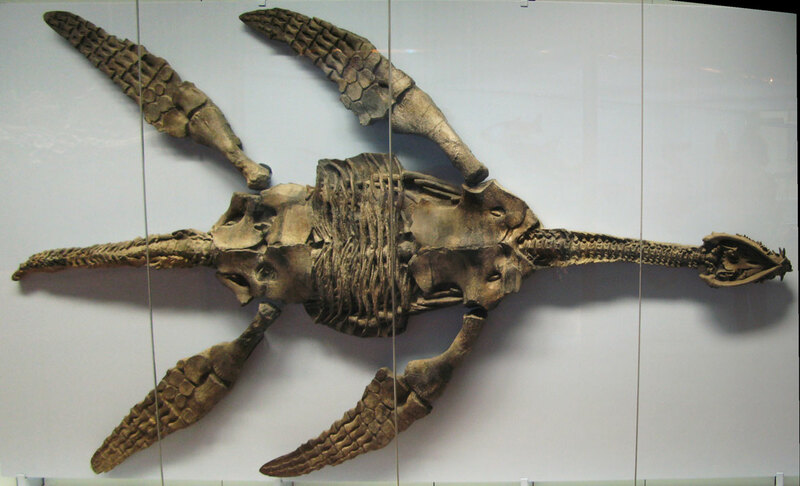 There’s nothing alive today quite like a plesiosaur. These four-flippered marine animals paddled themselves through the seas during the great Age of Reptiles, from about 205 to 66 million years ago. Some of them have long necks with tiny heads, while others bear short, burly necks topped with massive, crocodile-like skulls. Regardless of the "flavour" of plesiosaur being considered, palaeontologists have been puzzling over how these unusual reptiles managed to move through the water since their bones were first discovered in the mid-19th century. As it turns out, despite having four paddles, these marine reptiles may have propelled themselves through the deep with just two flippers. Palaeontologists have been poring over plesiosaur bones for nearly two centuries now, but exactly how the aquatic predators used their flippers has been a matter of ongoing debate. The two major points of contention involve the actual swim stroke and the marine reptile’s coordination. Did plesiosaurs move their paddles in a rowing motion like a boat’s oar, a flapping motion like a penguin, or something else? And did they move their front and back flippers at the same time or alternate them when propelling themselves through their underwater world? We’re at least 66 million years too late to watch live plesiosaurs in action, so computer scientist Shiqiu Liu and her colleagues did the next best thing: they constructed a life-sized model of the Jurassic plesiosaur Meyerasaurus victor and used that as the basis for a virtual model to help uncover the secrets of the plesiosaur stroke. While other plesiosaurs, like the extremely long-necked Elasmosaurus and the monstrous Kronosaurus, might be better known to fossil fans, Meyerasaurus was a perfect candidate for the model because it’s known from a nearly-complete skeleton, with its bones, including its intact flippers, still in their life positions. With such a spectacular skeleton as their guide, the researchers reconstructed the muscles, skin and other soft tissues to create their best estimate of what Meyerasaurus looked like in life. There are some unknowns, such as whether the muscle and skin fitted tightly around the paddles or had expanded soft tissue surfaces, but the researchers' model is nevertheless a close fit for what palaeontologists expect these marine reptiles looked like. With their plesiosaur in place, Liu and her team threw the marine reptile in a virtual pool to see how different swim strokes affected the model’s ability to move through the water. 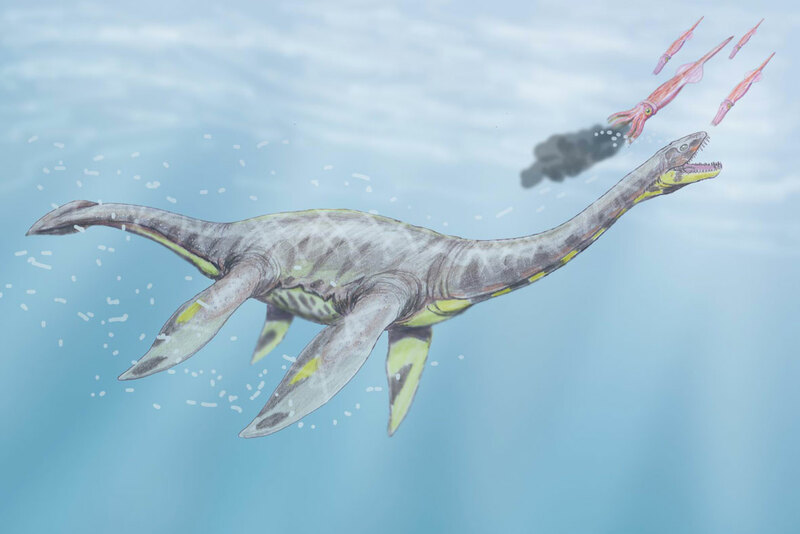 While it might seem logical that four flippers would be better than two, the study’s virtual Meyerasaurus performed best when primarily using its front paddles to move itself through the water. The plesiosaur’s rear flippers hardly contributed to propelling the reptile at all. Instead of flapping with all four paddles like “double penguins”, plesiosaurs may have moved more like today’s sea turtles – using their front limbs to push their bodies forward while using their rear flippers to steer. So the next time you watch a video of a sea turtle swimming along, imagine that reptile with a ludicrously long neck and you might start to get a feel for how the long-lost plesiosaurs moved gracefully through the seas. Header image: Liu et al.